What is Digital Radiology (DR)? Digital radiology (DR) is a form of x-ray imaging, where digital x-ray sensors are used instead of traditional photographic film. Advantages of digital radiology (DR) include time efficiency, as a result of being able to do without the standard chemical processing, as well as the ability to digitally transfer and enhance images. Also, less radiation can be used to produce an image of similar contrast. Digital radiology (DR) may represent the greatest technological advancement in medical imaging over the last decade. The use of radiographic films in x-ray imaging will become completely obsolete within a few years. An appropriate analogy that is easy to understand is the replacement of typical film cameras with digital cameras. Images can be immediately acquired, deleted, modified and subsequently sent to a network of computers. The benefits of digital radiography (DR) are enormous as it makes a radiological facility or department filmless. The referring physician can view the requested image on a desktop or a personal computer and often file a report just a few minutes after the examination was performed. The images are no longer held in a single location, but can be seen simultaneously by physicians who are many kilometers/miles apart. In addition, the patient can easily transfer the x-ray images on a compact disk or on a “disk-on-key” to take to another physician or hospital for consultation. Although digital radiography (DR) systems have the potential for dose reduction, experience shows that many facilities actually impart more doses to patients. The primary reason is that over-exposure goes undetected, unlike with film where the image turns dark or black. In digital imaging, in contrast, the image becomes better when there is over-exposure. Further, there is a tendency to take more images than necessary. In a study performed in several hospitals, it became obvious that the number of examinations per patient, per day increased after transition to digital radiography (DR). Also, it is very easy to delete images before archiving, and technologists tend to repeat exposure if the positioning is wrong or if there is motion blur. Such repeats normally go unreported. As a result, digital imaging has the potential to increase the number of exposures and therefore, patient dose. Due to the physical structure of the detector, detectors are frequently referred to as flat-panel detectors. In addition to forming part of an integrated digital radiography (DR) system, their shape allows them to be incorporated into retrofit digital bucky assemblies. There are also portable digital cassettes available, which are either sold as part of a system or can be retrofitted to an existing film/screen room. 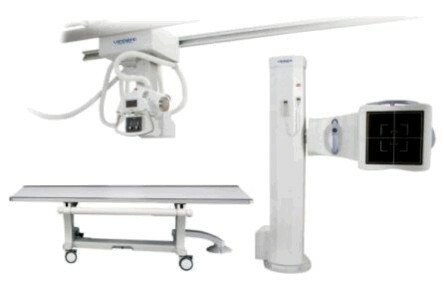 Mobile radiography systems with portable digital detectors are also available. Portable detectors can be connected to the review workstation by either a wire, or have a wireless communication interface. Many types of digital detectors will need some level of environmental control. This may be in terms of operating temperature range, rate of change of temperature and/or relative humidity. All types of detectors may not function optimally if outside the recommended temperature range, but normally recover once the temperature has returned to normal. Certain types of digital radiography (DR) detectors may be irreparably damaged if the temperature remains too high or too low for an appreciable period. Indirect conversion detectors first convert the X-ray photons to visible light photons in a scintillator, typically caesium iodide (Csl). The light photonos are in turn converted into electrical charge and read out with an amorphous silicon (a-Si) photos – detector/ thin film transistor (TFT) array bonded to the scintillator. The detector can be fixed or portable. Direct conversion detectors convert X-rays directly to charge, which is then read out. Most current systems use a layer of amorphous selenium (a-Se) coupled to an active matrix for read out. Charge coupled devices (CCDs) are sometimes used in digital systems for general radiography. A scintillator (Csi or a rate earth phosphor) is coupled to the CCD with a lens/mirror system. Due to the limited area of a typical CCD, a considerable degree of demagnification is required, which can have an effect on image quality. Slot scanning systems use a fan beam of X-rays, which scans the area of interest in conjunction with a slot detector. The detector is typically a linear array of CCDs coupled to a Csi scintillator, although other combinations; such as a rare earth phosphor coupled to a linear array of sensors, are in use. This arrangement provides excellent rejection of scattered radiation (and therefore potential for lower doses). The sensitivity of the detector is a measure of how efficiently the detector uses the incident X-ray photons and can be described in terms of various technical parameters, such as detective quantum efficiency (DQE). Sensitivity will depend on the technology and design of the detector and technically similar detectors from different manufactures may exhibit different sensitivities. Additionally, the sensitivity may vary with the energy of the incident X-rays.